Cut each rack into 2 or 3 manageable portions. Now add the rub (a lot). 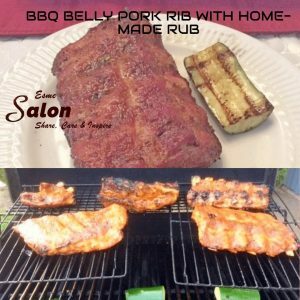 Yes, use your hands, and rub it into the rack of rib and set aside. As our veggies, we prepared 1 large BBQ Zucchini, sliced in half lengthwise and then into thirds. Again, paint with VOO, and that’s it. BBQ as is, till soft to your liking (we prefer it to still to be slightly crunchy) and you have beautiful grid lines on your Zucchini.